One of the goals of top bar beekeeping is to provide as natural a lifestyle as possible for the colony. The Top Bar Hive (TBH) is designed with the ultimate compromise in mind – a hive that can be managed for honey and other hive products, but a more bee-friendly life for the bees. Periods of severe dearth such a summer drought, or a harder than expected winter. When a top bar beekeeper does decide to feed the colony, he or she has to get creative. Several feeders have been designed to suit Langstroth hives, which have a standardized shape and size. Since there is little to no standardization in top bar hives, the TBH beekeeper must often design a new feeder, or modify a Langstroth feeder. One of the most common feeders is the Boardman Feeder. Originally designed to sit in the entrance slot of the Langstroth hive, it has been adapted by many TBH users. It can be adapted to feed from inside the hive or outside the hive fairly easily. 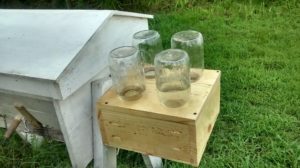 Boardman feeders can be purchased from many beekeeping supply vendors, and there are patterns galore available for the DIYers. The only objections to the Boardman is that they sometimes have to be filled more than once a day if the bees are drawing a lot of syrup and they can invite robbing if the slot they are used in is any wider than the lip on the feeder. And if you are feeding inside the hive, which is preferred since it minimizes robbing, you have to open the hive to check syrup levels or to refill the feeder. If placed outside a follower board, the colony does not have to be disturbed, but removing the lid is not always convenient. 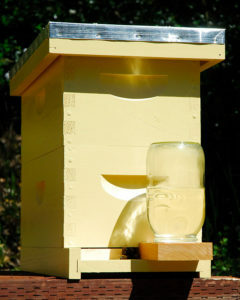 Creative beekeepers have created Double Boardmans which use two feeder jars rather than one, doubling the volume of syrup, thereby decreasing the frequency of filling. There are frame feeders, bucket feeders, and a variety of feeders designed to sit inside an extra hive box on top of the hive, under the top cover. None of these are easily, or even practically, adaptable to the TBH. Yard feeding is another option, but it also has drawbacks. One, the competition for feed can lead to its own set of problems. Two, it keeps a concentration of bees in the yard, which is not a good situation for backyard beekeepers, urban homestead beekeepers, and micro-homesteaders with other livestock sharing the space. Yard feeding should be left to commercial beekeepers and serious hobbyists with bee yards in sparsely populated areas. I recently discovered a TBH feeder system that I think is one of the best ideas I have seen yet. It was designed and installed by Mark Hopper. It features access for filling the feeder jars from the outside of the hive. The bees are not disturbed in any way during feeding. It has spaces for four (4) feeding jars which reduces the frequency of filling. If feeding needs are low, empty jars can be left in the unused spaces. Access to the feeder by the colony is from inside the hive through a tube created using a piece of 2″ PVC pipe. Since the feeder is entirely enclosed, and there is no outside access to the syrup, this design nearly eliminates the chances of robbing due to feeding. A weak hive may be robbed through its regular entrances, just as it could be without feeders, but this feeder does not serve as an additional attractant. Mark constructed the feeder using one 1×12-48″ LG, a 5″ length of PVC, wood glue, a few screws, and the 1/8″ screen for the bottom of the feeder. He estimates that including the jars, the materials for the feeder were about $15.00. He says that in his next design will have a solid bottom to exclude Small Hive Beetles. He used a table saw, miter saw, a Kreg jig for the pocket holes, and an air nailer for the basic construction. The tools you use may vary, depending on availability and skills. The hole for the PVC access tube was made with a 2 3/8″ hole saw, and a 3″ hole saw was used for the holes for the jars. The feeder is approximately 11 1/2″ x 12″ x 5″ deep. It could be made smaller and only accommodate 2 jars. It is attached to the legs of the hive from inside the feeder box with (2) 2 1/2″ self-tapping screws. The box does not need to be opened often, so the top is not hinged. There are (4) screws that can easily be removed for an annual cleaning, or to cap off the PVC for winter. This simple design can be modified for other top bar designs. There are many things to like about the feeder. It can be made with a variety of scrap lumber pieces. It can be filled from the outside of the hive, eliminating the need to expose the colony to weather, or to disturb the colony. Mark has an inspiring story – click here to read our online interview.